These care models are arising to address the unmet need for primary care services. The reason for the primary care shortage is twofold, with the lack of primary care physicians as the main problem and the lack, (or overcrowding) of primary care facilities as the secondary problem. The use of non-physician extenders such as nurse practitioners or physician assistants may address the first part of the problem, but they often use the same facility as the physician. As such, these providers actually compound the second problem by creating office crowding that leads to longer wait times and inefficient care. The first of the nontraditional models is known as “direct primary care.” This is a form of concierge health care that works outside of traditional insurance or managed care. It often wraps around the high deductible health insurance product and is less expensive and more efficient than traditional primary care services. This model, however, does not address the overall shortage problem, as it uses both a traditional physician and facility. The next model to review is the retail clinic model. This model uses nontraditional facilities such as a pharmacy or shopping mall. It also uses nonphysician practitioners, so this model will be effective in solving the larger problem. Look to see a major expansion model over the next few years. Another model that is evolving is telemedicine. There are many versions and varieties that run from a simple advice website for health and wellness to online, real-time doctor consultations. We have seen a big increase is this type of care in optometry that ,again, runs the gamut from simplistic smart phone refraction estimations to actual remote autophoropter exams with video slit lamp exams and real-time remote doctoring. This is also a viable model and will become a popular alternative to traditional primary care as well as mainstream optometric care. The last model that I want to review is the partnership of traditional providers with nontraditional providers to improve access, affordability and convenience. This model supports the primary care team approach and often includes optometrists as members of the team. This team approach has been used historically in health centers and staff model HMOs. It is now being evaluated in independent optometric practice by health plans such as Cigna, United Healthcare and others. By decreasing the demand on the physician and expanding the use of optometry office locations for primary care services, this model meets both objectives to resolve the shortage of primary care resources. There is a large role for optometry in resolving the primary care crisis in America. Our large numbers, broad geographic access and practice patterns make us the optimal provider for nontraditional primary care. Optometrists see their patients on an annual basis during a critical time in life for intervention to prevent chronic medical problems. --Redirect your continuing education to strengthen your base knowledge in primary care. --Work to improve your communication with primary care physicians. --Review the optometric practice act in your state to be sure that your scope of practice includes primary care and work to change it if it does not. --Learn to use and embrace new technology and telemedicine to expand the reach of your practice so you will be able to participate in these new progressive care models. --Seek out primary care opportunities in managed care, accountable care organizations and other new care models. With a little preparation and a movement out of the eye care silo, we can become leaders in the nontraditional primary care movement. Cigna. Evolving models of care delivery. Posted Sept. 4, 2015. Healthtrust. Nontraditional healthcare delivery: A revolution in care. Posted June 5, 2015. Ramsey L. Business Insider. A new kind of doctor's office charges a monthly fee and doesn't take insurance — and it could be the future of medicine. Posted March 19, 2017. Robeznieks A. Modern Healthcare. 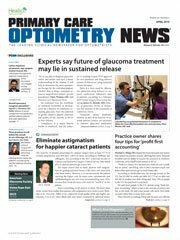 Optometrists eye bigger role in managing chronic conditions. Posted June 16, 2015. Siemasko E. Barton Associates. 3 Nontraditional primary care options to consider. Barton Associates. Posted April 13, 2016.